and finished with a double birthday celebration. Arriving in Alnmouth on a sunny Saturday we found a local arts festival in full swing, which added interest but created some problems for parking. On Sunday morning we met Di and John (who had offered to lead a walk around Lindisfarne) in Bamburgh. With time in hand while the tide went out exposing the causeway over to the island, we took the opportunity to visit the RNLI Grace Darling museum and enjoy some refreshments. 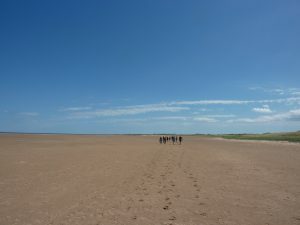 We then enjoyed a walk across vast beaches and attractive coastline around the island under a clear blue sky. The following day began with a scenic ride on the local bus to the picturesque harbour of Craster. 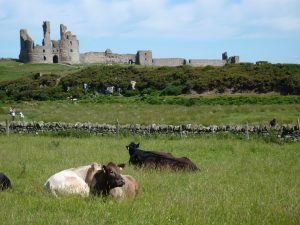 After a brief visit to Dunstanburgh Castle, and more refreshments, the day's walk took us south along the coast back to Alnmouth. This passed low cliffs teeming with nesting seabirds and over sandy beaches. 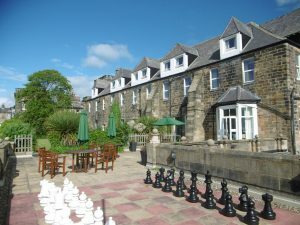 We headed inland to Rothbury on the final day. Here the group split, with some visiting NT Cragside, a large house and grounds with some fascinating pieces of Victorian engineering. 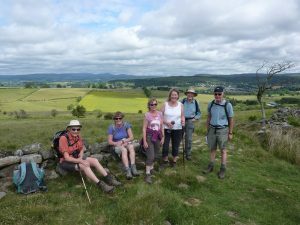 The rest tramped across the Simonside Hills which involved four miles of steady ascent with great views across the Coquet valley. We appreciated the 'super express’ path with stone slabs laid over the soft peat soil. The height was quickly lost with a steep descent, returning to Rothbury via Thropton. 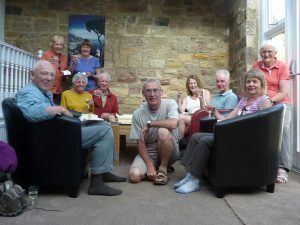 Once back in Alnmouth, Nicky and Dave kindly invited us in join in their 70th birthday celebrations with cake and prosecco.